Clean out boxes: I do this after each nesting, but better late than never. Roosting: Prepare nestboxes for winter roosting by sealing up ventilation holes and/or insulating the floor. More information. Downy woodpeckers seldom if ever nest in boxes, but they will roost in unused boxes, usually arriving right before dusk. Sometimes they excavate the interior a bit. Waterproofing: Late summer (after nesting season ends) or fall is a good time to do annual waterproofing of nestboxes, because you should do it when the box is not in use. Double check the caulking of the various seams of the box and re-caulk if needed before waterproofing. Icicle Prevention: If you’re in a really cold climate, and the roof allows icicles to form in front of the entrance hole, birds could get trapped inside. To avoid this, mount the box so the box is tilted slightly to the side so water drains away from the entrance hole, or make boxes with a roof that is slanted so it drains to the side or the back. Repairs: If you opt to leave your boxes up year-round, take measurements of the various parts of your nestbox to have them handy for winter days of making repair parts. Sometimes wintering critters will chew or excavate your boxes resulting in springtime repairs being needed. 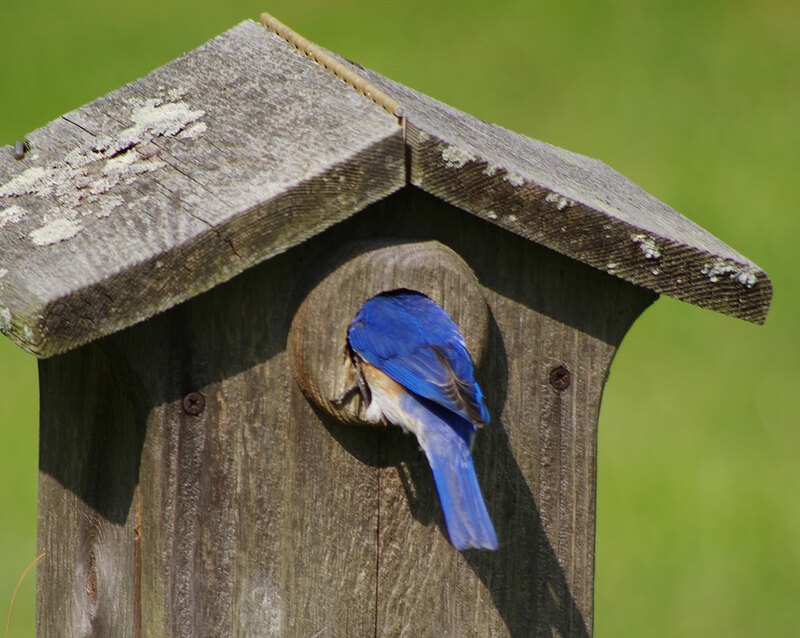 By January (southern blues are real close to nesting), you should have ready various repair parts for your boxes – new interior wall liners might be needed if woodpeckers roosted. Replacement hole-guards might be needed. New box-fronts or hole repair pieces to ‘fix’ an entrance hole that may have been enlarged by squirrels, woodpeckers, mice, etc. By mid-winter, begin checking the fasteners that mount your boxes on their poles, to be sure none have broken, rusted, or worked loose. This can save a fallen box during nesting season. Take down or leave up various shade devices, unless you want to use them to shield against raging winter winds. Keep an eye out over the fall for when field grasses start dying – time to collect lots of soft dead grass for IN CASE replacement nests are needed next year. See how to do a nest change. All winter, take your preferred steps concerning House Sparrows if they are in your area. 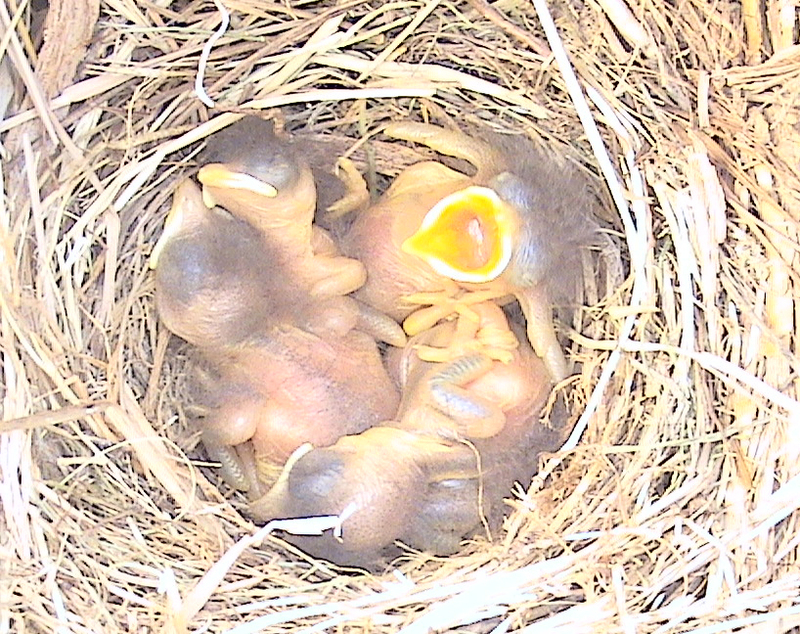 Feed: Offer suet (you’ll have to train them first) when temperatures are below 40 degrees and insects are not active. Plant: Fall is also a great time to plant trees, shrubs and vines that produce berries that will attract birds and help them survive the winter. Water: Eating snow for moisture uses up extra energy. A heated birdbath can help birds, but your electric bill will go up. You can also use a heated dog food bowl (less expensive than a heated birdbath) with pebbles in the bottom to keep it shallow.